This drawing shows some of the playground equipment that will be used at the Veterans Park. An all-inclusive city park with a splash pad is a step closer to happening. 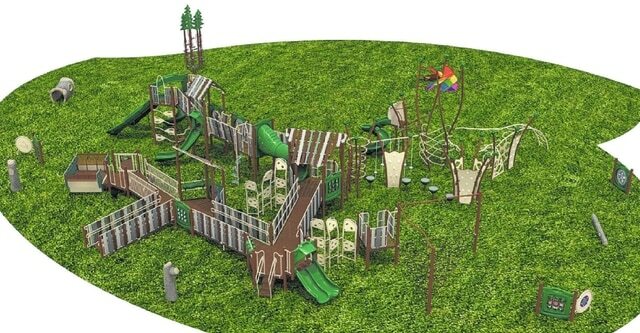 On June 22, Delaware’s recreation levy subcommittee approved re-allocating $350,000 from the levy’s contingency funds to make up a deficit in constructing facilities and the playground for the Veterans Park near the YMCA off South Houk Road. “I’m really glad that they put the inclusion of all kids playing as a top priority for the playground,” said subcommittee member and City Council member Lisa Keller, who pushed for the reallocation. The current funding is $1,870,000 for the park, but is insufficient to pay for it as planned. The re-allocation would bring the total to $2,220,000 which should be enough to pay it in full, officials say. The playground elements of the park are dinosaur-themed. Among the equipment is a mound that has climbing walls and a slide out of a dinosaur skull; and a splash pad amid brontosaurus bones. At the meeting, Keller said she had done all she could to reduce costs at the park without cheapening the materials. Assistant City Manager Jackie Walker and Keller said that once the park is complete, it will receive regional and national recognition for its amenities. City Council will still need to sign off on the reallocation, but Keller was confident it would be approved, because four council members were on the subcommittee. The Veterans Park may be open on Memorial Day in 2016.